Last Sunday, Nola, the Northern White Rhino at San Diego Zoo, passed away aged 41, leaving only three of her kind the world. However, it is not always the end for critically endangered animals. The Indian Rhino was in danger of extinction and now the species is thriving. The last three remaining White Rhinos are in Kenya, at Ol Pejeta Conservancy. The last two females are incapable of reproducing naturally and efforts to breed have failed. Sudan, the old male's, only (low) chance of reproduction would be through IVF and he is the last male of his subspecies! Poachers are after their horns, which are used in traditional Asian medicine, and worth about £50,000 per kilo. Even though fifty years ago there were still over 2,000, poaching means they were declared extinct in the wild in 2006 after the last were killed in the Democratic Republic of Congo. With the three rhinos in Kenya, there is still a small hope to save them from extinction, but it is a long and arduous effort: A lot of money has been put aside to make six southern white rhinos have surrogates for embryos. The research however is still underway, and northern white rhino calves may only been born ten to fifteen years. The species will most likely be extinct by then as the three on the Kenya reserve are not likely to live as long. 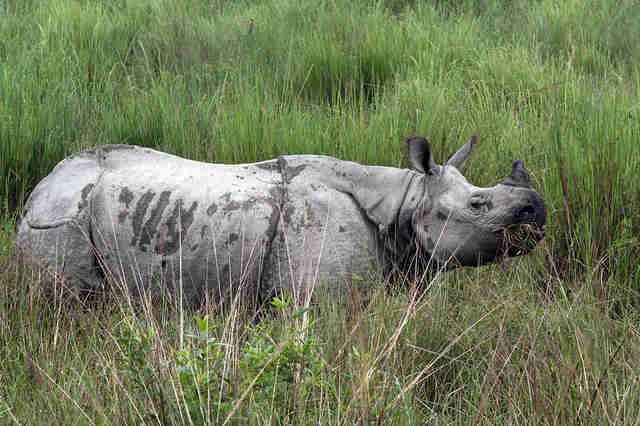 Meanwhile, almost 4,000 miles east in Nepal, the Greater one-horned rhino is thriving! Forty years ago the species was endangered, with only 600 left in the wild. Now, its status on the ICUN Red List has moved from "endangered" to "vulnerable" and there are over 300 in the wild. In Nepal, spread across over 350 square miles of national park, live over 500 animals. Chitwan National Park, at the foot of the Himalayas, is home to Bengal Tigers, bisons, leopards, antelopes, Asian Elephants, crocodiles, hares, and many others. It is the perfect habitat for Indian one-horned rhino, who has been re-introduced to the area. The East Rapti River and small lakes are perfect to cool down during hot days and some animals have been tagged to allow park rangers to monitor the population. Rhinoceroses have a gestation period of 16 months, and take care of their calf for two to three years before she is ready to mate again. She stays with her young until a new one is born. A full grown rhino doesn't have many predators; it outweighs every animal but the elephant, swims very well and can run up to 35 miles per hour and is overall friendly. As herbivores, they don't need to find prey and simply graze most of the day. Their main predator is the human. With 80 per cent of the rhino population living in South Africa, some rhinos need armed guards to protect them from poachers. In Kruger National Park alone, over 800 animals were killed last year, and another 400 in other parts of the country. 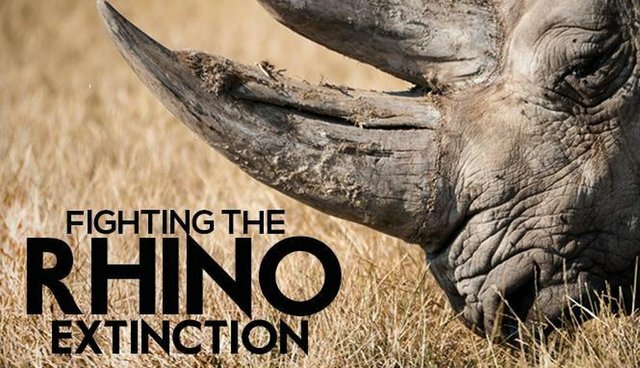 Just this week, the court has lifted the ban on the sale of rhino horns which was set up six years ago as a way of fighting the poaching problem. The global ban may be lifted next year after the Convention on International Trade in Endangered Species of Wild Fauna and Flora – but will it be too late for some of the rhino species by then?